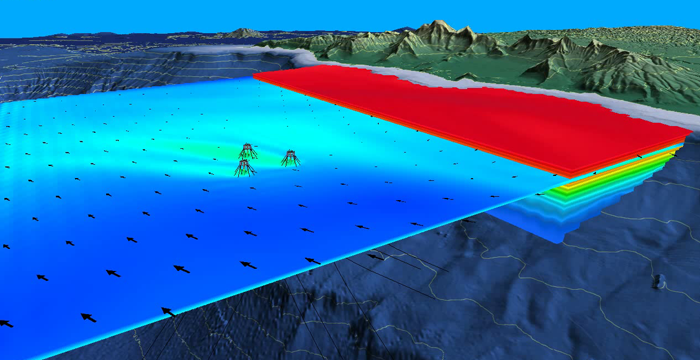 Makai has expanded its environmental and coastal modeling services for clients who discharge into, or withdraw from, the world’s oceans, lakes, and reservoirs. In 2015, Makai completed a 3-year effort to adapt the EPA-approved Environmental Fluid Dynamics Code (EFDC) into a robust and flexible dispersion and water quality modeling tool. The new Makai EFDC modeling system (M-EFDC) is specifically designed to simulate and predict the dispersion of large industrial water flows. Combined with Makai’s experienced team, the new M-EFDC enables cost-effective modeling solutions ranging from initial project planning to more rigorous regulatory submissions and watershed management efforts. The adapted M-EFDC model is a state-of-the-art hydrodynamic and water quality model used to simulate aquatic systems in up to three dimensions and time. The modeling results are used in the design, planning, and permitting process for the intake or discharge of a variety of facilities, including desalination, seawater cooling systems including once through cooling systems, LNG processing plants, petroleum refineries, traditional thermo-electric power plants, pulp and paper mills, chemical manufacturing plants, food processing plants, and metal manufacturing plants. The M-EFDC suite can model flows across a wide range of sizes and time-scales. This enables developers to understand the physical, chemical, and biological impacts and decide between design variations in the water system. For example, M-EFDC can help with the site selection for the water intake or discharge pipes, model thermal and chemical plume dispersion, and enable regional nutrient and biological studies. The Makai EFDC model simulating the discharge plumes of three offshore ocean thermal power plants. Time-varying model results were visualized with Makai’s dynamic 3D viewer ( Watch this! ). While these plumes are offshore, the model works equally well with coastal and lake discharges. 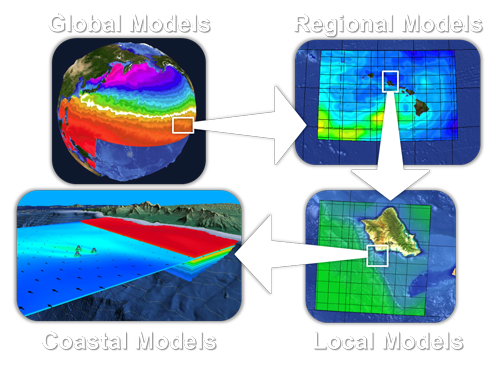 Under DARPA and Department of Energy funding, the M-EFDC model was originally developed to predict the physical, chemical, and biological impacts around offshore Ocean Thermal Energy Conversion (OTEC) plants in Hawaii. The model was adapted to dynamically couple a turbulent plume model with a regional ocean circulation model and predict both near-field mixing and far-field dispersion of discharge flows; a critical enhancement for accurately resolving larger scale discharge flows. The model integrated regional circulation from tides and atmospheric conditions, nutrient cycles, and phytoplankton population dynamics. Results were shown to reproduce the historical 20 year observational dataset collected by the Hawaii Ocean Time Series. Ease of Use: a front-end initialization tool provides efficient and flexible model setup. Clear Results: accurate modeling and visualization of plumes provides stakeholders with a clear understanding of impacts. Versatility: useful for anything from simple studies to detailed regional and biological models. Proven Technology: the M-EFDC model is derived from one of the most widely used and technically defensible hydrodynamic models in the world over the last 20+ years and is EPA-approved. Most recently, Makai developed a front-end initialization tool for the M-EFDC model to satisfy a broader range of client needs more efficiently. The front-end tool automates nesting of the M-EFDC grids within 3rd party regional ocean or coastal models (e.g. ROMS or HYCOM), import of local tidal conditions from the TPXO global database, or inclusion of user defined time series based on site measurements or known flow conditions. More generally, the model can be forced with regional flows, tidal flows, atmospheric forcing, and river or terrestrial sources, enabling the simulation of flows that vary with space and time across complex seafloor terrain. 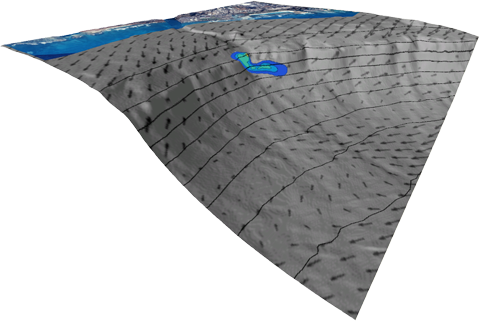 In addition, the tool enables quick and automated setup of simpler hydrodynamic studies for project planning. 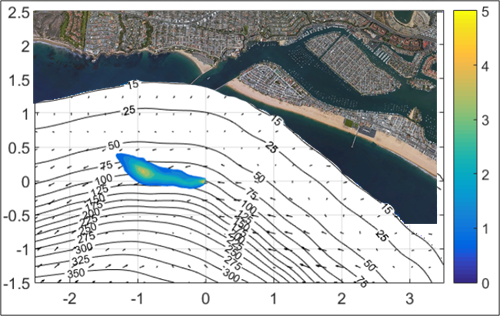 Below: M-EFDC has been used to simulate offshore outfall plumes in the context of real ocean models. Such modeling and the resulting visuals help developers understand the dispersion and dilution of the outfall plume in the local region. M-EFDC‘s discharge model with terrain-following grids has been enhanced to model large and dense (e.g. brine) coastal discharges such as for seawater air conditioning (SWAC), desalination, LNG cooling, and once-through cooling of power plants. For these large flow systems, the tool’s use of coupled near-field and far-field models provides several advantages. For example, the tool seamlessly handles space and time scales that range from meters to kilometers and from days to years. Plant developers and operators can use the tool to clearly visualize and present results to regulatory authorities and other stakeholders. The high-fidelity and dynamic model can predict a wide range of possible plume conditions, allowing the user to estimate the statistical likelihood of plume sizes and properties that are typically required by the Department of Health and EPA for permitting. Makai developed a numerical hydrodynamic model to assess the physical impacts of OTEC discharges in the ocean environment with funding from the National Defense Center of Excellence for Research in Ocean Sciences. Considering that no utility-scale OTEC plants have been constructed, it is uncertain how the nearby ocean environment will be affected by the discharge of the nutrient rich deep ocean water. The project’s goal was to create a toolset to use for sustainable design of OTEC plants, which for a 100MW plant would require 720 m3/s of cold nutrient rich seawater and 420 m3/s of warm surface waters. This software is the most sophisticated tool for modeling OTEC’s environmental effects to date. When run with an OTEC plant, the model can determine the size, depth, and flows of the OTEC plant’s seawater discharges that would minimize plankton increases. In all cases modeled in Hawaiian waters, no increase in plankton levels occurred in the upper 40 meters (130 ft) of the ocean. From 40 to 120 meters (130 – 400 ft) OTEC-induced plankton growth is low and well within the naturally occurring variability. These results suggest that suitably designed large OTEC plants will cause no significant increase in biological growth. This model will be important to developers and regulators as commercial OTEC develops.